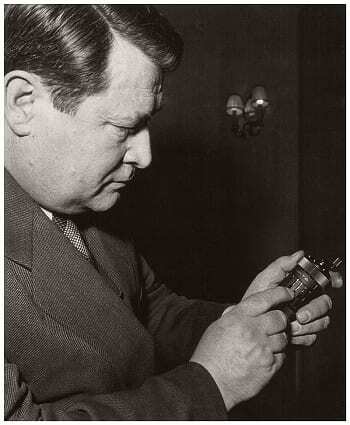 The Curta calculator was invented by Curt Herzstark, born 1904 in Austria, whose family owned a company that made calculating machines and other precision instruments. Calculators at the start of the 20th century were not portable like the examples today, but rather were desktop size and mostly heavy (as another example, see below, in our collection demonstrates). 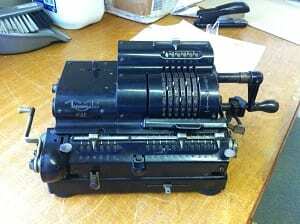 Through his work as a salesman for his family company, Curt recognised the demand for a portable calculator. Something sturdy enough to be used on a building site or in the field, but which could fit in a pocket and be used by one person. He began working on the idea in the early 1930s, and in 1938, a year after he took over the company after the death of his father, he was able to register two patents for a prototype design. 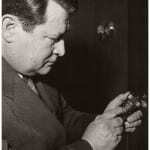 However, in March 1938, just before he filed the patents, Austria was joined in Anschluss (union) with Nazi Germany. Curt’s mother was a Catholic Christian, however his father was Jewish. Under the Nazi’s Nuremburg Laws of 1935 this made Curt a Mischling in the first degree. This mixing of ‘Aryan’ and Jewish blood was, in the eyes of the Nazis, potentially more dangerous than someone with two Jewish parents. Dr Gerhard Wagner, leader of the National Socialist German Physicians’ Federation, believed such people were more dangerous because “their mix of German and Jewish blood would enable them to lead the state’s enemies ‘with the skill of Aryans’” . The unification of Germany and Austria was therefore potentially disastrous for Curt and his siblings. However, unexpectedly to us now, even after the outbreak of the Second World War, Curt was not arrested and deported like so many others. This could be as a result of his company’s work. Apparently when German soldiers inspected the Herzstark family factory they were so impressed they ordered it to stop all non-military work and only produce equipment for the German war effort. This put Curt in the bizarre position of being a part Jewish person producing war equipment for the Nazi state. This precarious existence was not to last, and in 1943 Curt was arrested by the Nazis. Two of his employees had been discovered listening to the BBC and transcribing the broadcast for dissemination. At least one of them was executed and when Curt attempted to interject he was arrested for ‘helping Jews and subversive elements’ and for ‘indecent contact with Aryan women’. Buchenwald concentration camp. The clock above the entrance permanently records the time of the camps liberation – 3.15. 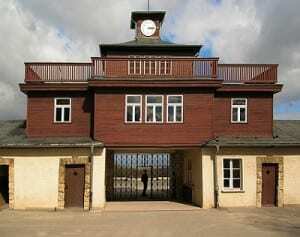 ” Buchenwald – Concentration Camp Gate ” by Andreas Trepte – Own work . Licensed under CC BY- SA 2.5 via Wikimedia Commons. After his arrest he was sent to a Jewish prison in Prague before being transferred to Buchenwald concentration camp in East Germany. Here due to his past experience he was classed as an ‘intelligence slave’ and put to work at a factory that adjoined the concentration camp. He was given a position supervising work and was able to save several other prisoners by creating jobs for them to do. In a twist of fate the owner of the factory had known Curt before the war, which may also have saved his life. 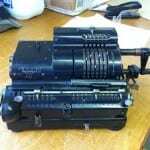 Thankfully the Nazis did not win the war and the calculator was never presented to Hitler, however by the time of the camp’s liberation in April 1945 Curt had redrawn and redesigned the Curta from memory. After liberation Curt approached a company in East Germany with his plans, and three prototypes were made. However Curt became fearful that the Soviets, who controlled East Germany, would forcibly deport skilled workers to Russia. He dismantled the three prototypes and, disguising them as children’s toys, smuggled them to Switzerland. Here, following further efforts to find companies willing to make the calculator, he was approached by Prince Franz Joseph II of Lichtenstein who was keen to modernise his country. The first commercial models came out in autumn 1948 and came in any colour, as long as you wanted black. know this model was made in 1965. The original name of the calculator was intended to be ‘Lilliput’, however following a trade fair in Basel in 1948 one of the companies trade correspondents remarked that the calculator was like the daughter of Curt, ‘when the father is Curt, the daughter has to be Curta’. The name stuck. 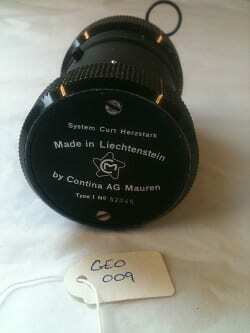 In total an estimated 140,000 calculators were made between 1948 and 1972 and, although Curt Herzstark resigned as Technical Director of the company he helped found (Cortina AG) in 1951, he continued to be involved with the company for some time. Curt Herzstark died in 1988. A great deal of the work on which this blog is based came from a BASc student, Margaux Bricteux, who researched this object as part of her 2nd year module ‘Object Lessons: Communicating Knowledge Through Collections’. The story of Curt Herzstark and the Curta Calculator is a fascinating example of how with a little research an objects history can enrich our understanding of the past, while continuing to resonate in the present and for the future. 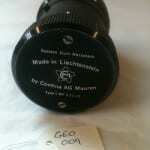 Nick Booth is one of the Teaching and Research Collection Curators at UCL. This blog was updated on 24/02/2016 to correct the source of the first image – Curt Herzstark with one of his calculators. Thanks for your comment Bary. 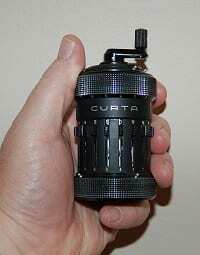 This website has some fantastic images of the Curta inner workings, including a link to a Curta simulator – http://www.vcalc.net/cu.htm. The 1965 date is funny, but as you say i suspect that at the time the Curta was cheaper, and perhaps also bigger and less portable…? Though I don’t know for sure.